Krispy Kreme began making the world famous original glazed doughnut over 75 years ago. It was December 11th, 2001 that the experience came to Canada with our first store in Mississauga, Ontario. Soon after, our first store opened in Quebec in Montreal. From then on, Krispy Kreme became a destination for those looking to experience the magic of our hot and fresh doughnuts and coffee. In 2010, we opened our first Doughnut Café in downtown Toronto. Our cafés bring the fresh experience to our loyal customers in neighbourhoods across the city. We want our cafés to be convenient and comfortable spot to enjoy a doughnut, sip a coffee, and savour one of our freshly baked muffins, croissants, or bagels. Look for cafés opening near you soon. 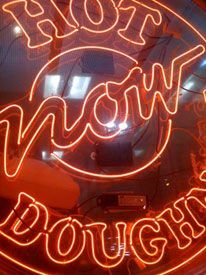 Our Doughnut Cafés receive deliveries of fresh doughnuts twice per day from our Hotlight Factory stores. With a warm and welcoming store environment and comfortable seating, our cafés provide the perfect pit-stop for a coffee, doughnut or snack.